Gazing into the mirror: Lilith Wozniak takes a trip to Newport to soak in Mike Brookes’ demanding, philosophical piece, the third in his Storm Cycle project for National Theatre Wales. Storm. 3: Together and Alone at The Neon, Newport. Photo by Mark Douet. I think if I’d been in a bad mood before going to see Storm 3: Together and Alone I would not have liked it. As it was I rather did. I suppose you could say that of a lot of shows – that the mood you see it in will affect whether or not you like it – but it feels particularly relevant for Storm 3, the third in a series of works created by Mike Brookes (some with long-term collaborator Mike Pearson) and staged in different locations around Wales through 2018-2020, each a riff on themes of turbulence and change. It is particularly relevant because of how hypnotic the show is. It lulls you and entrances you and makes your mind drift as much into yourself as along the levels of the show. At least it did for me. And I know that that can be a hard state to exist in when I’m in a bad mood, spiralling into negative thoughts and stresses. But I’d had a lovely trip there – the venue was really well sign-posted from the train station (something that seems simple but meant it was the first time that I’d navigated a new city without my phone in a long time), when I got there the venue staff were super helpful recommending somewhere to grab food, and that somewhere was itself really lovely *. All of this meant I was entirely in the mood for a show that was simultaneously demanding and easy to drift through – it was really rather pleasant both to switch between drifting along on the surface and diving deeper into the thoughts that the show germinated. This is all a bit vague, so here is what the show is actually like; you walk up a large sloping platform and find your space, either standing or sitting on one of the myriad bags of clothes strewn about. Above this there are two large screens projecting slogans – ‘we are putting ourselves first’. The set feels like something you’d find in a modern art gallery (the sloping floor making it particularly reminiscent of the Tate Modern’s Turbine Hall). A performer walks up the ramp. She delivers a speech (maybe 10 minutes?) on the nature of the self, in precise philosophical language to a backing of pulsing ambient music. The music changes, and the lights and four strong fans turn on. The slogans change and another performer enters. They deliver their speech and the process repeats. The text itself is curious. All I knew before I entered was that the show was based on Simone de Beauvoir’s Pour une morale de l’ambiguïté, and there were quite a few moments where I thought performers might be reciting directly from her text, until something came up – a particular way of phrasing, a word here and there – that made me feel like it couldn’t possibly be, but maybe that was just the performers making the whole thing seem very modern. But still, the text takes the tone of a Serious Philosopher –working through a problem from personal to general statement and back with inference and reasoning – this thing therefore that. The kind of text that you want to follow as it skips entrancingly from thought to thought, but which only frustrates if you cling on too hard. I’m sure everyone who saw it will have different stand out performers from the group of 8 local actors and spoken word artists. I personally really enjoyed Connor Allen’s almost relaxed delivery, and was completely entranced by Rufus Mufasa’s simultaneously forceful yet calm, angry yet contained tone. It was only after the show that a friend mentioned it to me that it was, in some ways at least, a ‘Brexit play’. And it definitely works as a comment on our national predicament – confronting our rights and responsibilities as people, why we take the actions we do and what consequences they have. But to be honest I think it is a much more boring play if just thought of through this frame. 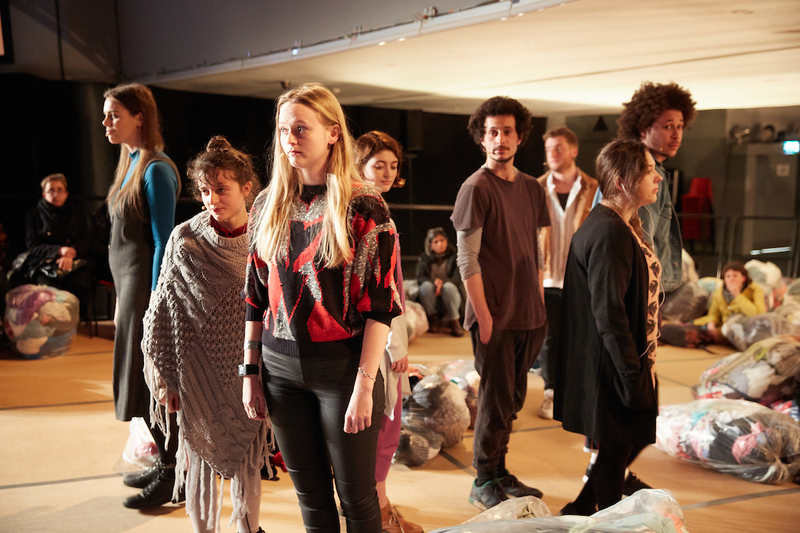 It is a play about people – as individuals and as a collective. The questions it asks are often unclear and it offers no easy answers. Even the seemingly simplest ways of thinking about being a person it retreads, checking for loose floorboards and gaps of logic. If theatre is about holding a mirror up to the world, this is a show that is staring at its own reflection, investigating every pore and hair. And its form allows the audience to join in on that process of self-reflection – the show taking place as much in our own branching trains of thought as on the slope itself. So while it does provide some reflection that is desperately needed in a country saturated with confusion, it also feels like it confronts things much more deep-seated and enduring than one political crisis. * Am I allowed to recommend a restruant in a theatre review? If I am allowed then I absolutely will. IF YOU ARE IN NEWPORT GO TO RAGTAG PIZZA. The guy who ran it was lovely, the atmosphere was super warm and most importantly the food was big and delicious. Tangent over.